The Australian Bulk Handling Review is pleased to announce the release of the 2018/19 edition of its Equipment & Services Guide, now available for viewing in digital true-to-print format, and on the official guide website. 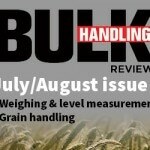 The Bulk Handling Equipment & Services Guide is the annual companion publication to the Australian Bulk Handling Review, and is the premier industry reference guide to who does what and where in bulk materials handling sciences and technologies. The directory is available on the official website, and is also available in print format – making it an essential tool on the desks of bulk handling professionals around the world. Click here to view the digital edition of this year’s guide.